Mazu launch the new 42 Walk-Around, with the first unit delivered early August 2017, and shown at the Cannes and Monaco yacht show. A center console type cruiser the new Mazu 42 main selling points are a modern T-top superstructure covering the helm, and the two spacious lateral walk-around. 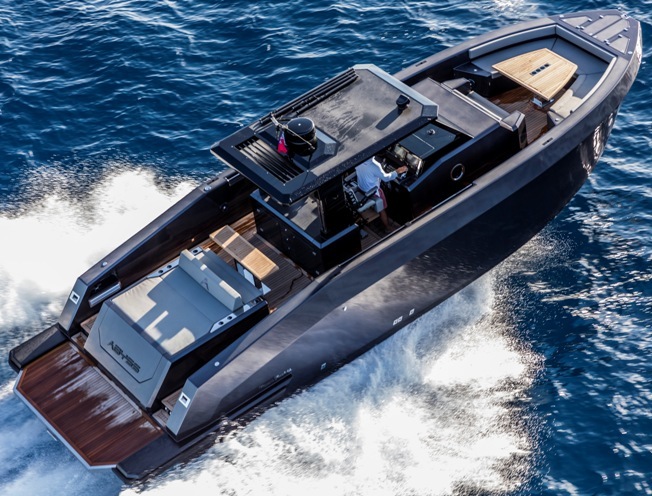 The Mazu 42 Walk-Around has a free-board that is high enough to allow safety movement on deck even while at sea. The looks of the 42 Walk-Around evoke a combination of sportiness with military details. On-deck comfort is assured by the ample aft sun bathing area, while forward the cockpit is complete with a V-shaped settee and a second settee forward of the console. The size of the aft platform has allowed the yard to create a true seaside terrace, ideal not only while at anchor but also when moored to the jetty, facilitating going aboard, and tender stowage. The presence of a mobile kitchen with Gaggenau appliances ensures leisurely and pleasurable times when at anchor. Mazu 42 Walk-Around is powered by two 435hp Volvo engines with IPS pod drives with top speeds up to 47 knots and a cruise of 32.